COMMENTS:        This trigger occurred at longitude,latitude = 313.90,18.56 [deg]. Dec(J2000) = +17d 18' 38"
with an uncertainty of 3 arcmin (radius, 90% containment, including systematic uncertainty). The BAT light curve showed a single-peaked structure with a duration of about 0.5 sec. The peak count rate was ~5000 counts/sec (15-350 keV), at ~0 sec after the trigger. Dec(J2000) = +17d 19' 53.9"
with an uncertainty of 3.7 arcseconds (radius, 90% containment). This location is 103 arcseconds from the BAT onboard position, within the BAT error circle. This position may be improved as more data are received; the latest position is available at http://www.swift.ac.uk/sper. We cannot determine whether the source is fading at the present time. A power-law fit to a spectrum formed from promptly downlinked event data gives a column density consistent with the Galactic value of 7.14 x 10^20 cm^-2 (Willingale et al. 2013). UVOT took a finding chart exposure of 150 seconds with the White filter starting 84 seconds after the BAT trigger. No credible afterglow candidate has been found in the initial data products. The 2.7'x2.7' sub-image covers none of the XRT error circle. The 8'x8' region for the list of sources generated on-board covers 100% of the XRT error circle. The list of sources is typically complete to about 18 mag. No correction has been made for the expected extinction corresponding to E(B-V) of 0.08.
with an uncertainty of 2.1 arcseconds (radius, 90% confidence). Analysis of the promptly available data is online at http://www.swift.ac.uk/sper/713782. We observed field of Swift short hard GRB 160927A (Gibson et al., GCN 19952) with Russian-Turkish 1.5-m telescope (RTT150, Bakirlitepe, TUBITAK National Observatory, Turkey) using TFOSC. We obtained four 600s exposures in SDSS-r filter at high airmass and very poor seeing (2.5 arcsec) starting at 18:59:24 UT, i.e. approximately 55 min after the burst. The 50cm robotic telescope (D50) of Ondrejov observatory in Czech republic reacted robotically to the alert of GRB160927A (Gibson et al, GCNC 19952), obtaining a series of 10s unfiltered images starting at 18:05:29.9UT, i.e. 40s post trigger. 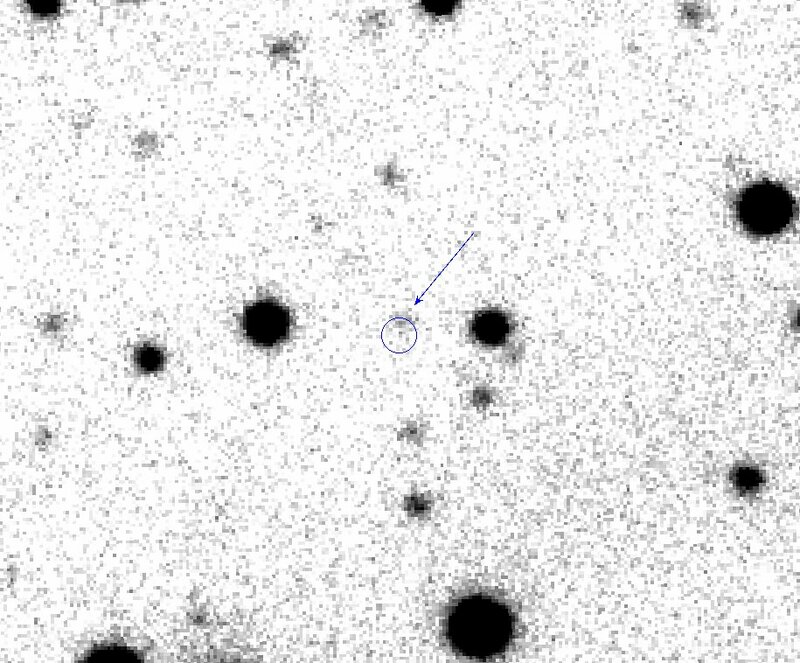 We do not detect any new source within or near the XRT error circle (Evans, GCNC 19953) in comparison to USNO-B1.0 catalog neither in single images (3-sigma limit R>18.7) nor in a combined 25x10s frame (mean exp time 124s post trigger, 3-sigma limit R>20.5). We observed the field of the short GRB 160927A (Gibson et al., GCN 19952) with the 3.6m Telescopio Nazionale Galileo (TNG) equipped with DOLoRes. Observations were carried out in the r-sdss filter. Observations started on Sept 27 at 20:12:49 UT (2.13 hours after the burst) and consist in a series of 5 images, each one lasting 180 seconds. +/- 0.5". The object has a magnitude r = 22.6 +/- 0.1 (calibrated against nearby SDSS stars). This object is the same reported by Tkachenko et al. (GCN 19954). Given the mild evidence for fading, we propose this object as the optical afterglow of GRB 160927A. Dec (J2000): +17d 19' 55.1"
We have analysed 6.6 ks of XRT data for GRB 160927A (Gibson et al. GCN Circ. 19952), from 89 s to 13.2 ks after the BAT trigger. The data are entirely in Photon Counting (PC) mode. The enhanced XRT position for this burst was given by Goad et al. (GCN Circ. 19953). The light curve can be modelled with a power-law decay with a decay index of alpha=0.99 (+0.08, -0.07). A spectrum formed from the PC mode data can be fitted with an absorbed power-law with a photon spectral index of 1.72 (+0.29, -0.17). The best-fitting absorption column is 7.6 (+9.0, -0.4) x 10^20 cm^-2, consistent with the Galactic value of 7.1 x 10^20 cm^-2 (Willingale et al. 2013). The counts to observed (unabsorbed) 0.3-10 keV flux conversion factor deduced from this spectrum is 3.9 x 10^-11 (4.3 x 10^-11) erg cm^-2 count^-1. If the light curve continues to decay with a power-law decay index of 0.99, the count rate at T+24 hours will be 9.0 x 10^-4 count s^-1, corresponding to an observed (unabsorbed) 0.3-10 keV flux of 3.5 x 10^-14 (3.9 x 10^-14) erg cm^-2 s^-1. The results of the XRT-team automatic analysis are available at http://www.swift.ac.uk/xrt_products/00713782. We observed the field of GRB 160927A (Swift trigger 713782; Gibson et al. , GCN #19952) simultaneously in g'r'i'z'JHK with GROND (Greiner et al. 2008, PASP 120, 405) mounted at the 2.2 m MPG telescope at ESO La Silla Observatory (Chile). Observations started at 23:26 UT on 27/09/2016, 5h 21m after the GRB trigger, and continued for ~1 hour, mostly during astronomical twilight. They were performed at an average seeing of 1.8" and at an average airmass of 2.
r' = 23.9 +/- 0.4 mag. The apparent fading since the RTT150 and TNG observations is convincing evidence for this source being the afterglow, and further suggests a steepening of the afterglow light-curve since the TNG observation. The given magnitude is calibrated against SDSS zeropoints and is not corrected for the expected Galactic foreground extinction corresponding to a reddening of E_(B-V)=0.07 mag in the direction of the burst (Schlafly & Finkbeiner, 2011). We observed the field of GRB 160927A (Gibson et al., GCN 19952) using the 2.56-m Nordic Optical Telescope (NOT) equipped with the ALFOSC camera. Observations started at 21:24:39 UT on 2016-09-27 (i.e., 3.33 hr after the trigger) and 5x300s SDSS r-band frames were obtained. The previously reported optical afterglow of the burst (Tkachenko et al., GCN 19954; D'Avanzo et al., GCN 19956; Wiseman et al., GCN 19959) is clearly detected in our stacked r-band image. It has m(r)=23.07 +/- 0.10 at a median time of 3.56 hr post-burst, calibrated with nearby SDSS stars. Combined with the RTT150, TNG, and GROND data points reported in the above GCN Circulars, we confirm the steepening of the afterglow light-curve (Wiseman et al., GCN 19959). A rough estimate gives rise to alpha_1~0.6, a break time of ~3.1 hr post-burst, and alpha_2~1.7 (but poorly constrained). Dec(J2000) = +17d 20' 01.8"
with an uncertainty of 1.8 arcmin, (radius, sys+stat, 90% containment). The partial coding was 50%. The mask-weighted light curve in 16 msec binning shows at least two peaks. The first peak starts at T-0.2 sec, peaks at T+0.2 sec and ends at T+0.3 sec. The second peak starts at T+0.3 sec, peaks at T+0.4 sec and ends at T+0.5 sec. T90 (15-350 keV) is 0.48 +- 0.10 sec (estimated error including systematics). The time-averaged spectrum from T+0 to T+0.54 sec is best fit by a simple power-law model. The power law index of the time-averaged spectrum is 1.12 +- 0.26. The fluence in the 15-150 keV band is 1.4 +- 0.2 x 10^-7 erg/cm2. The 1-sec peak photon flux measured from T-0.23 sec in the 15-150 keV band is 1.9 +- 0.3 ph/cm2/sec. All the quoted errors are at the 90% confidence level. We imaged the field of GRB 160927A detected by SWIFT(trigger 713782) with the robotic telescope of (IAU station 565) Bassano Bresciano Observatory, Italy. Member of: AAVSO - American Association of Variable Star Observers. ISSP - Italian Supernovae Search Project. UAI/SSV - Unione Astrofili Italiani/sezione stelle variabili. The observations started 11.72 min after the GRB trigger, with our Newton telescope D=250 mm F/D=4.8. We co-added 52 exposures of 60 sec each. We did not found any optical counterpart in the error box of the XRTcandidate. S. L. Gibson (U Leicester), N. Gehrels (NASA/GSFC), et al. We imaged the location of the short-duration GRB 160927A (Gibson et al., GCN 19952) with the Inamori-Magellan Areal Camera and Spectrograph (IMACS) mounted on the Magellan/Baade 6.5-m telescope at a mid-time of 2016 Sep 28.00 UT (5.94 hr post-burst). We obtained 4x200-sec of r-band exposures in 0.75" seeing at an airmass of 1.9. We clearly detect the optical afterglow (Tkachenko et al., GCN 19954; D'Avanzo et al., GCN 19956; Wiseman et al., GCN 19959; Xu et al., GCN 19960). Tied to 10 SDSS stars in the field, we calculate a magnitude of r_AB=23.84 +/- 0.21, not corrected for Galactic extinction in the direction of the burst. The AMI Large Array robotically triggered on the Swift alert for the short/hard GRB 160927A (Gibson et al., GCN 19952) as part of the 4pisky program, and subsequent follow up observations were obtained up to 3 days post-burst. Our observations at 15 GHz on 2016 Sep 27.79, Sep 28.70, and Sep 29.70 (UT; 1 hour, 23 hours, and 47 hours post-burst respectively) do not reveal any radio source at the XRT location (Page et al., GCN 19958), with 3sigma upper limits of 132 uJy, 119 uJy, and 110 uJy respectively. The 3sigma upper limit from the first two epochs combined is 80 uJy. The short-duration GRB 160927A (Gibson et al., GCN Circ. 19952) was detected by the ground analysis of the CALET Gamma-ray Burst Monitor (CGBM) data at 18:04:49.88 on 27 September 2016. The highest signal-to-noise based on the light curve data is 5.3 sigma. The burst signal was seen by the SGM instrument. The light curve of the SGM shows a single peak starting at T0, peaking at T+0.4 sec and ending at T+0.6 sec. The T90 duration measured by the SGM data is 0.35 +- 0.11 sec (40-1000 keV). We observed the afterglow of the short-hard GRB 160927A (Gibson et al., GCN 19952) with OSIRIS on the 10.4m GTC telescope. Observations consisted in 10x190s exposures in r-band, with a mean epoch on 28 September 2016 at 20:26 UT (26.52 hr after the burst). The optical counterpart (Tkachenko et al., GCN 19954; D=E2=80=99Avanzo et al., GCN 19956; Wiseman et al. GCN 1959; Xu et al., GCN 19960; Fong et al., GCN 19964) is detected at a magnitude of r_AB =3D 25.3+/-0.2, as compared to several SDSS field stars. Combining this observation with the rest of the available GCN data, the light curve indicates an early evolution with a shallow decay, followed by a faster decay (as already mentioned by Wiseman et al. GCN 1959 and Xu et al., GCN 19960), with the break at around the TNG epoch, after which we estimate a decay rate of with alpha =3D -1.03+/-0.08 (where F~t^alpha).This decay is significantly shallower than the one reported by (Xu et al., GCN 19960), indicating that the light curve may be flattening at the time of the GTC observation. This could be due to the contribution of an additional component (either the host galaxy, or more unlikely the contribution of a kilonova) or just due to the uncertainties of the different photometric measurements.